A Slated Score is a representation of each member's work experience based on film credits. This number, calculated by Slated Analytics, is out of 100, and is based on a blend of box office revenue, profitability and critical acclaim. Scores are adjusted for inflation and weighted by recency. The resulting score is displayed on each person’s profile pictures, on the bottom right corner, and on their profile page, in the top right hand corner. Members with multiple roles will be scored for each, with the top score being highlighted in an orange box, and secondary scores in gray. 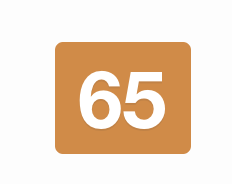 By hovering your cursor over the top right hand scores on profiles you can also see what percentile each score falls in relative to all other people or companies with that same role on Slated. You can also see which company affiliation (if any) contributed to that score. Not every member on Slated will receive a Slated Score. By default everyone on the site arrives with no score at all - unless business track records and performance data suggest otherwise. You may also disable your score from being visible to other Slated members by going to your settings and selecting "Only Me". Please note, by disabling your score you will also lose the ability to see other people's scores.